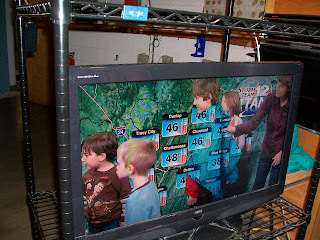 This morning we went on a field trip to one of our local television stations. 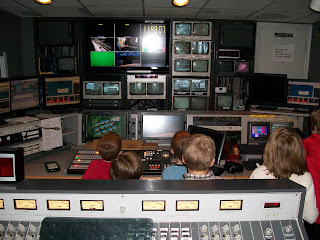 This was by far my kids favorite field trip to date! I really think the highlight of their whole visit was watching themselves "disappear" on the studio's green screen. Not only was this a fun field trip, but it was very educational. I doubt we'll ever look at the news the same again! Haley had the opportunity to pretend to be a newscaster and read the mornings news from the news desk, while on camera and reading the teleprompter. She loved it! Here the kids are "disappearing" on the green screen! Checking out the command center. 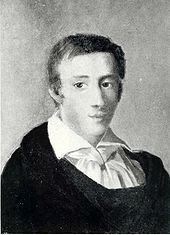 This week we're studying Frédéric Chopin. We will be listening to his music, reading about his life, and completing some really cool notebooking pages that I got from www.notebooking.com. 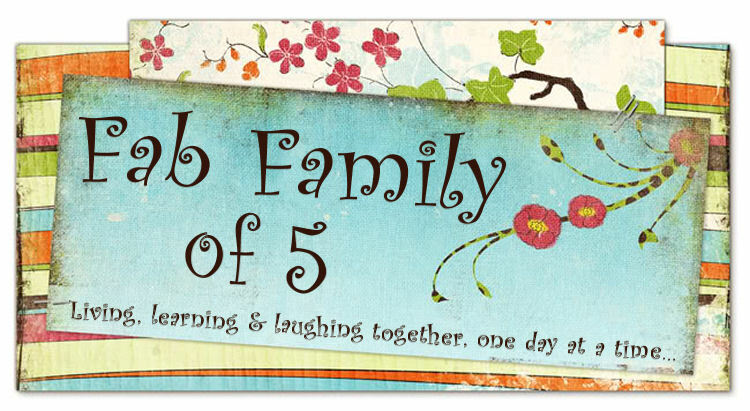 If you haven't checked out all of the notebooking pages they have available, you really should! There are so many awesome pages and ideas that I hardly know where to start. We're also doing some notebooking using our frog eggs. It is now Day 4, and not only have the eggs all tripled in size (the interior brown dot), but now their moving! Just really fast jerking movements so far. Its just amazing how fast they change. They look completely different from day to day. At this rate they'll be frogs and ready to go back to their pond before we know it! Oddly enough, even though this past Saturday was the official start of Spring, its snowing here today. Go figure... Obviously, somebody forgot to tell Old Man Winter that it was time to move on. For those of you who don't know us, my family enjoys participating in our local theater. We are all currently working on the play The Hobbit. The kids and I have very minimal parts, but my husband has a larger one. We're getting closer to the actual play in mid April, and we've been busy with practices. This week was no exception. On Friday we took a walk to the pond near our house. 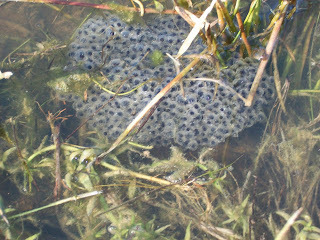 We found frog eggs. We collected a few in order to watch them grow from start to finish. This is what they looked like on Friday, March 19th. I'll post more pictures as they develop! Saturday was spent working on our new garden. I'm trying something completely different this year called Square Foot Gardening. I'll let you know how it works out. I hope all of you have a wonderful and relaxing weekend!! 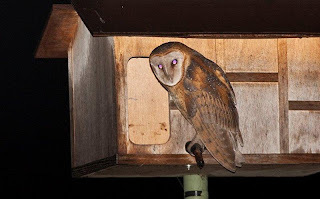 Click here to see a live web cam of a wild barn owl in a nesting box located in California. She is sitting on 5 eggs which are due to hatch any day now. Her name is Molly, and her mate is McGee. He visits regularly and brings her dinner. I just can't wait until the babies hatch! This same site also has links to lots of other live web cams located all around the country. There are even a few from Africa, Canada & Europe. Sure to be a HUGE hit with the kids! 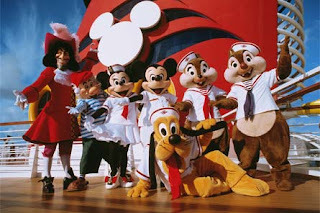 Choose & Cruise Sweepstakes: Your chance to choose and WIN a Disney Cruise vacation for 4 at http://bit.ly/9ngT81 - NO PURCHASE/PAYMENT NEEDED. Register today! Last night I stayed up late finishing The Last Song by Nicholas Sparks. I am a huge fan of most all of his books, and this one was no exception. I haven't cried that hard in months! What I wouldn't do for even an ounce of his writing ability. This story is a coming of age story with all that entails. First love, families, faith, life and ultimately death. I won't go into the story so as not to spoil it for you if you want to read it. This one has also been made into a movie, so you can bet I'll be going to see it when it's released! It gets an A+++++++ in my book. 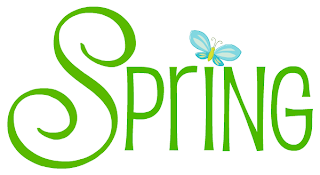 Is it just me or are you suffering from Spring fever as well? Maybe its the warmer weather we've been having, or maybe its just knowing that the end of the school year is in sight. I have been having the hardest time staying focused and on track! I think it has alot to do with the fact that we spend so much time indoors over the long cold winter, that I'm just dieing to find new ideas and things to do outdoors. I've been doing some planning for next school year, looking at products and purchasing some things that we'll need. Yeah...aren't tax refunds wonderful! I'm hoping the arrival of new materials will give me the boost I need to rejuvenate our days. I just love finding new materials to teach with. How about you? In our family, scheduling is always a challenge. As the kids have gotten older, we've added more and more activities. This can make keeping to a schedule VERY challenging. As a rule, we try to get started each day by 10:00. That allows us to enjoy breakfast together, get some chores done, and then settle in for school. We always start out the day with our core subjects such as math, grammar, phonics & spelling. We finish up with as much as possible before breaking for lunch around 12:30 or 1:00. After lunch we'll get in history, science & any extra subjects such as art, music or Spanish. In the afternoon, the kids will read, play online educational games, watch a video that corresponds with what we're learning, and then head outside for free time. Evenings are spent reading out loud, Bible stories & prayers before bed. This is the ideal schedule, but it can be tough to get everything in. What's your schedule like? Its that time again! This year Pizaa Hut is signing up individual homeschool families, rather than homeschool groups. In order to sign up, you need to go to their website. The deadline for signing up is June 30, 2010. This week we are starting a new series to allow my kids to become familiar with various types of music, instruments and composers. Each week we will focus on one of these to study. 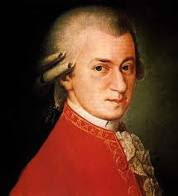 This week we're studying Mozart. We began our day by listening to some of his work, watching a concerto performed live on You Tube, and reading a short biography about him. I'm always amazed by how much of the work from these composers is still used today. So many of the pieces are very familiar to us! What a crazy week! Everyone in our house, with the exception of Haley got sick this week. Just one of those nasty cold viruses that makes you super stopped up, not sleep well, and feel basically yucky. Even the family that I babysit for 3 days a week had it. This did allow us some time off to get well. We had a busy week regardless, with almost 3 inches of snow early in the week, followed by what felt like Spring temps by the end of the week. No wonder everyone is sick! We have lots of activities going on this weekend as well. 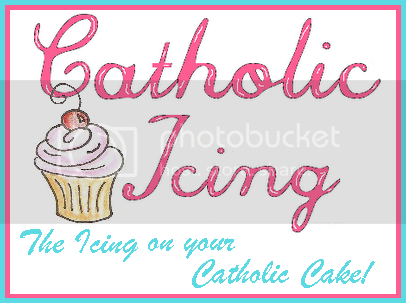 We have a cookie booth sale with the girlscouts, rain gauge making with cub scouts, a Scout mass at church, and a dinner afterwards. Haley had her weekly drama class where parts were assigned. She is playing the part of the princess' maid in Aladin. We also had play practice for The Hobbit with the entire cast, which was really fun. Its really cool to see the play come together! On Friday morning we went to see The Wizard of Oz at the theater. It was amazing!! I know that this year isn't even done, but I tend to do my curriculum planning in late winter/early spring. (This just happens to correspond to when we get our tax refund & I have money to spend.) Next year I'm making some changes...again. For those who know me, you'll know that this is not uncommon. Let's face it, there are just so many awesome products out there, and so many choices! I get bored easily. This is the lineup so far. Saxon Math 2 - No changes here. I knocked around the idea of changing back to Math U See, but finally decided to leave it alone. Saxon just seems more through to me and the boys are doing great with math. Explode the Code - We will be finishing up Book 2 by the end of this school year, and will continue using this program. Both boys are now reading really well. Easy Grammar 2 - I purchased this book when Haley was in 2nd grade and it seems to have done the job. All About Spelling - This will be new for us. We've been using A Reason for Spelling Level A this year, but just haven't enjoyed it. I'm looking for something a bit different this time around, and this one comes highly recommended. I'll post a review once we've used it more. The Story of the World Book 1 - We will be continuing with this book, and will hopefully finish it by the end of the school year. I Can Do All Things Art - This was another purchase made when Haley was in 2nd grade. We haven't used it at all really. My plan is to set aside one day each week to do art. R.E.A.L. Science Odyssey, Earth & Space Level 1 - We have been using Living Learning Books and unit studies for science up until now. I'm hoping this program will be a bit more in depth. Also, we haven't studied earth and space extensively yet. Power Glide Spanish - This is one of the items that tends to get left out each week if we get too busy. I intend to make it a weekly must. Nothing like snow in the South! Today, we had almost 3 inches of snow fall in a very short period of time. I'm so thankful that my children are homeschooled and were able to enjoy it this morning. By this afternoon when the school kids were finally sent home early, a lot of it had already melted. The kids built their biggest snowman ever, went sledding, and then came inside for some hot chocolate to warm up. Later in the morning we made snow cream for the first time. It was YUMMY and super simple! Mix thoroughly and enjoy immediately as it doesn't freeze well.